While our fruit gift boxes make an excellent option for some, our fruit gift baskets step up the elegance a notch and offer a truly stunning option filled with fruits, jarred goods, and other items designed to suit your specific gift-giving needs. 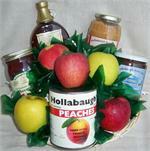 Who needs to send flowers when you can send a Hollabaugh fancy gift basket? This basket is Berry-licious!! Blueberry crumble mix, blackberry syrup, strawberry preserves, berry scone mix, raspberry curd and fresh fruit make this basket a delight! Make someone feel Peachy!! Peach preserves, peach syrup, canned peaches, peach cobbler mix and fresh fruit make this the perfect gift for anyone who loves peaches! Give a meaningful, beautiful gift without breaking the bank! Approximately 10 pieces of assorted fruits packaged in a reusable basket. 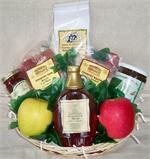 Add a preserve or apple butter to enhance the gift appeal! There isn't a soul who wouldn't love to receive a gift like this! A half dozen cookies, muffin, scone, dumpling, and fresh fruit make up this delightful treat. . . all fresh baked, of course! What a better pair than apples and cheese? Choose this awesome basket and get 2 blocks of cheese, a cheese spread, a pack of hard pretzels, a paring knife, and 6 pieces of fruit! Attention hearty breakfast lovers! Country ham, hickory smoked bacon, pancake mix, flavored syrup, apple butter, preserves, and plenty of fresh fruit fill this basket to the brim with everything you need for a filling, country-style breakfast! Double the sweet, fresh-baked goodness of our Sweet Pea Basket! A dozen cookies, muffins, scone, dumpling, whoopie pies, and eight pieces of fruit! You know what they say: "An apple a day..."! Our Get Well Basket is sure to make anyone feel better with soup, hot tea, honey, soothing honey-filled drops, and an apple a day for over a week! This basket is perfect for those who love to munch! Caramel popcorn, apple snitz, flavored pretzels, licorice, 2 trail mixes, candies, soda, and fresh fruit heap this basket full! Perfect for the diabetic in your family! 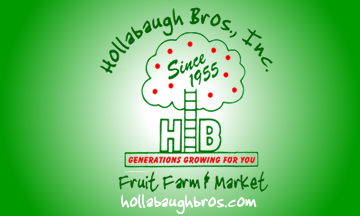 Fruit preserves, fruit syrup, apple butter, apple sauce, canned peaches, and plenty of fresh fruit... all no sugar added! It's the perfect time to Grill!! This basket comes equipped with everything you need to create the perfect cookout! A Grillin' sauce, Grillin' spices, a spicy snack mix and of course a few pieces of fruit! For the serious Griller! More of what you need to create the perfect cookout! 2 Grillin' sauces, Grillin' spices, Sweet & Spicy Mustard, a large, spicy snack mix and 6 pieces of fruit!